Unfortunately, leadership does not have a one-size-fits-all definition. We all have our own ideas as to what makes a good leader and the types of challenges that will be faced. The author bridges a gap by presenting how modern leadership happens while simultaneously combining a description of leadership and its practical application in today’s environments. 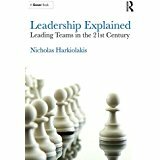 In this book, Nicholas Harkiolakis integrates the various theoretical perspectives into a unified model that can be understood by both the academic and the practitioner (existing and future leaders). This understanding is necessary to effectively treat and apply leadership to the challenging settings of today’s operational environments: virtual, distributed, multicultural, and so on. Some of the key topics covered are: leadership through the ages, characteristics of leadership, modern perspectives, an integrated leadership framework, the application of leadership, the twenty-first-century leadership practices. Citation: Harkiolakis, N. (2017). Leadership Explained: Leading Teams in the 21st Century, Routledge. The argument here is against the more commonly held view that diversification at the level of the individual entrepreneur, rather than that of the established corporation, is the wrong business strategy to pursue in times of economic crisis. Entrepreneurship always proves, in almost every circumstance and every part of the world, to be a way out of economic straits and it is widely accepted as the primary force that helps produce self-sufficiency, social inclusion, job creation, capital formation, and skills acquisition. Threats to job stability in today’s economic climate are expected to trigger latent entrepreneurship that could lead to re-investment of social capital to generate financial capital. Cash nowadays might not be the main value-added commodity. In an information society some of the basic ingredients of successful entrepreneurship, such as confidence and social capital might be equally important. Contrary to received wisdom in relation to SME diversification, the ability to run a group of businesses as a profit ecosystem rather than business units might prove to be beneficial in volatile economic times. If conditions improve one can always focus on growth of the most profitable and promising units. Yet in unstable economic times, resorting to back-up alternatives away from the mainstream business of organizations might be a solution to sustainable development. Citation: Harkiolakis, N. (2014). 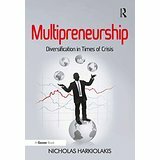 Multipreneurship: Diversification in Times of Crisis, Routledge. Practical negotiating skills, including those needed for cross-cultural negotiations have long been taught in classrooms, along with some of the theory that underpins them. Most of this has been based on the notion that negotiation will be interpersonal and face-to-face. 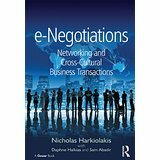 In recent years, though, globalization, the telecommunications boom and the ever increasing need for today's professionals to conduct cross-cultural business transactions has led to a new way of negotiating, bargaining, and resolving disputes. In this book we highlight the challenge that awaits the young professionals who are today training in business schools. Future dispute resolutions and bargaining will take place between faceless disputants involved in a new kind of social process. Any adolescent with a mobile phone and Internet access knows that most of today's social transactions take place via a hand held or other electronic device. In a world of video conferences, chat rooms, Skype, Facebook, and MySpace, critical financial, business and political decisions are made through interaction between two-dimensional characters on screens. Here, the authors compare and contrast e-negotiation as it currently is with traditional face-to-face negotiation. Case studies illustrate how cross-cultural negotiations can be managed through modern channels of social influence and information-sharing and shed light on the critical social, cognitive and behavioral role of the negotiator in resolving on-line, cross-cultural, conflicts and disputes, and generally in bargaining and negotiation. This book, with its practical exercises, will be of immense help to students and professionals needing to 'practice' with the new negotiating media. Citation: Harkiolakis, N., Halkias, D., Abadir, Sam (2012). e-Negotiations: Networking and Cross-Cultural Business Transactions, Gower. A leader’s role in the management of change is a critical issue for successful outcomes of strategic initiatives. Globalization and economic instability have prompted an increase in organizational changes related to downsizing and restructuring in order to improve financial performance and organizational competitiveness. Researchers agree that a leader’s inability to fully understand what is needed in order to guide their organizations through successful change can be a reason for failure. Proper planning and management of change can reduce the likelihood of failure, promote change effectiveness, and increased employee engagement. Yet change in organizations must be viewed as a continuous activity that affects both organizational and individual outcomes. If change management can be considered as an event induced by socio-cultural factors, the cultural variable gains greater significance when applied to the quality of the relationship between a leader and their team. Many organizations today are on the verge of internationalization. It is here that the cultural context can affect behaviours and, in the same way, leadership style. The research presented in this book by an eminent group of scholars will explore the influence of culture – ethnic, regional, religious – on how leaders manage change within organizations. Citation: Halkias, D., Santora, J.C., Harkiolakis, N., Thurman, P.W. (2017). Leadership and Change Management: A Cross-Cultural Perspective, Routledge. A third of the world's entrepreneurial activity is driven by women. With the mass movement of people now commonplace, the role of female entrepreneurs in immigrant communities has become an increasingly important component of the world economy, its productivity, and the struggle against poverty. Throwing light on the dynamics of entrepreneurship generally, and on immigrant and female entrepreneurship in particular, the global Female Immigrant Entrepreneurship (FIE) project is a huge and exciting research undertaking. Written by the project's team of researchers based in prestigious business schools and universities on almost every continent, this important book begins the process of discovering why and how female driven business start-ups often seem to spontaneously emerge in adverse environments. Is it randomness, luck, or chance that determine success or failure, or vital critical forces and the inherent qualities of the women involved? The research emerging from the FIE project points to answers to questions about the integration of immigrant communities, their interaction with host economic and business environments, and the role of women in that interaction. With findings from more than fifteen countries, from the USA with some of the world's oldest and largest immigrant communities, to African countries that are the newest destination for Asian migrants, this book will help inform social and economic policy in communities and countries searching for prosperity. More than that, the book offers policy makers, business leaders, and those concerned with business development the chance to uncover some of the mystery around the complex phenomenon of entrepreneurship itself. Citation: Halkias, D., Thurman. W. P., Harkiolakis, N., Caracatsanis, S. M., (2011). 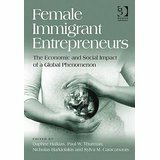 Female Immigrant Entrepreneurs: The Economic and Social Impact of a Global Phenomenon, Gower. With respect to quantitative research it is apparent that while most students have some exposure, to statistics mainly, at the time they entered graduate studies most of their understanding and familiarity with quantitative techniques is forgotten or vaguely remembered. 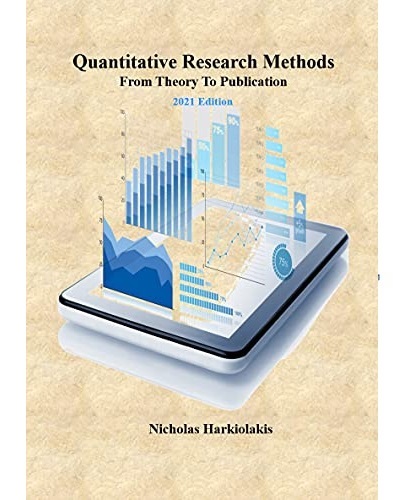 The assumption is made in this book that the reader doesn’t know anything about quantitative research and about research in general. All concepts presented in the book are defined and introduced. Also, alternative and overlapping expressions and keywords used in quantitative research are presented so the reader can identify them in their readings of academic research. Whether this “zero-to-hero” approach succeeded is left for the reader to judge. For researchers in a hurry to get their hands dirty it is recommended to start with Chapters 2 and 3, replace the Chapter 4 material with the cheat sheets in Appendix B, and continue with Chapter 5. If needed, they can always delve in the more advanced material of Chapter 6. For someone who is interested in the details behind the most frequently used methods Chapter 4 should be considered as well as Chapter 6. Citation: Harkiolakis, N. (2017). Quantitative Research Methods: From Theory to Publication, Create Space.